Traveling with a pet can be stressful, for both you and them. If you will be driving to each assignment, you may want to start taking your pet on short trips to see how it does with car sickness and anxiety. This will also give your animal time to adjust to being in the vehicle. Once you begin traveling, plan to stop every 2-4 hours to relieve your pet and do a quick walk. We also like to keep plastic bowls, a freezer bag of dog food and a gallon container of water handy. There are only a handful of hotels and motels that allow pets so plan ahead. On long trips, you may have to drive a little further or stop sooner than you want to find one of these hotels. Motel 6 and almost all La Quinta Inns and Suites allow pets at no additional charge. A lot of higher-end hotels allow pets but in addition to the more expensive room, they also charge a high deposit fee. If you plan on flying to your assignments, each airline has their own policy about flying with pets so you should make sure you plan ahead and check with the airline prior to traveling. Keep in mind that this can be too stressful for some pets and is not advised for puppies or kittens. Your animals will need time to adjust each time you move. You may want to consider not leaving your animal home alone for a few days just so they can get comfortable with their new temporary home. When you do venture out, try to start with shorts trips until they realize they are not being left behind for good. We like to get everything unpacked that they are familiar with like blankets, toys, and doggy beds. Our dogs seem to relax and understand this is our new home the more we unpack. If you have a dog that is used to a fenced in yard, you will want to get him used to walking on a leash before you start traveling. You will also want to invest in waste bags. Most apartment complexes ask that you clean up after your pet when he does his duty. If you are traveling alone, you will have to decide how you will manage your pet when you are at work. Twelve hour shifts are probably too long to ask your dog to hold it. Most hospitals will only give you a 30 minute lunch break so going home on lunch probably won't work. Your only other options are to use puppy pads or hire a dog walker. 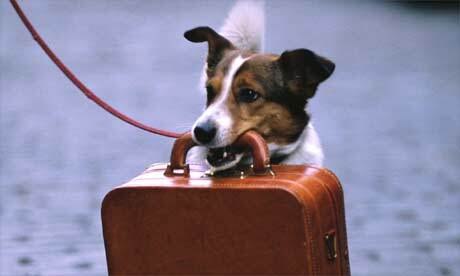 It's important to let your agency know you are traveling with a pet so they can find proper housing that allows for pets. You may have to pay a small monthly fee to the apartment complex in addition to paying your agency a pet fee. For me this was a one-time refundable $600 fee to the agency on my first assignment. It's just to ensure costs if your dog would make a mess of the apartment. Once our dogs proved to be OK, we have not had to pay that fee again. When you are arranging your own housing, it can be a struggle to find apartments that allow pets. Also, some complexes have breed restrictions or animal weight limits. You will be responsible to pay for any up front pet deposit costs, monthly fees, and some apartment complexes require you provide them with the animals shot record. Speaking of shot records, there are a few other reasons to keep your pet's vaccinations up to date. Most groomers will not service your dog if you are behind on shots and will ask for proof. There are also additional risks that come with traveling. Apartments that allow pets are usually full of pets because they can be hard to find. Dogs and cats can get sick from each other just like humans. Keeping up with their shots is cheaper than the alternative if they were to get worms or parvo from another dogs waste and have to be treated. You may find that the responsibilities of being a pet owner could prevent you from making the most of each assignment. We do a lot of outdoor hiking so we generally take our animals along. However, there have been a few times it has been difficult for us to do the things we wanted because we didn't know anyone in the area that could care for our dogs while we are away. A kennel or doggy day care is usually an option in most areas, especially in bigger cities and near popular attractions. Our male dog would not do well in that environment, so ultimately our plans have to be accommodating for our pets. Hope this helps anyone thinking about traveling with pets. Just keep in mind they need time to adjust to changes in their new lifestyle. Be patient with them, plan ahead and save yourself and your animal unnecessary stress. We would love to hear any tips you might have about your experience traveling with pets. As a travel nurse, Stasha Crawford has had the opportunity to travel coast-to-coast along with her husband Brad. While she concerns herself with the “nursing” issues, Brad likes to focus on the travel aspect. Together they have created TravelNurseHelp, a website designed to combine much of the info a travel nurse needs in one place. This blog was re-published from TravelNurseHelp with their permission.